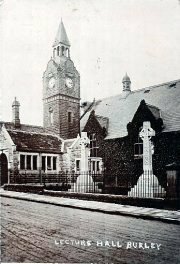 _Now The Queen's Hall, with the Celtic cross memorials to Fison and Forster. William Fison and his wife, Fanny, lived in the 1820s mansion at Greenholme, which had belonged to her father, Jonas Whittaker, the previous owner of the mill estate. The house was set in 50 acres of parkland. Fison spent most of his working life in Burley, taking a paternal interest in all village affairs. Along with Forster, he was responsible for setting up the Local Board of Health in 1854, starting the Mill School in 1856, building the Lecture Hall in 1868, and donating the Recreation Ground to the village in 1897. The central figure (in top hat) in the family portrait taken in the 1890s, is William Fison, a few years before he died in 1900 aged 80. The gathering on the steps of the house probably includes his eldest son, who became Sir Fred Fison MP, and on the right the Vicar, Revd. Charles Ingham Black. After Fison died a Celtic cross was set up in his memory in front of the Queen’s Hall, alongside one in memory of Forster.